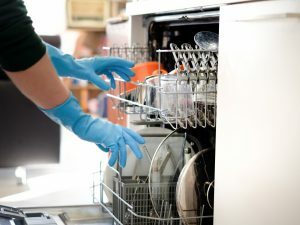 Our dishwashers are often taken for granted until they go wrong – then you remember how terrible it is to have to wash every dirty dish and utensil by hand! 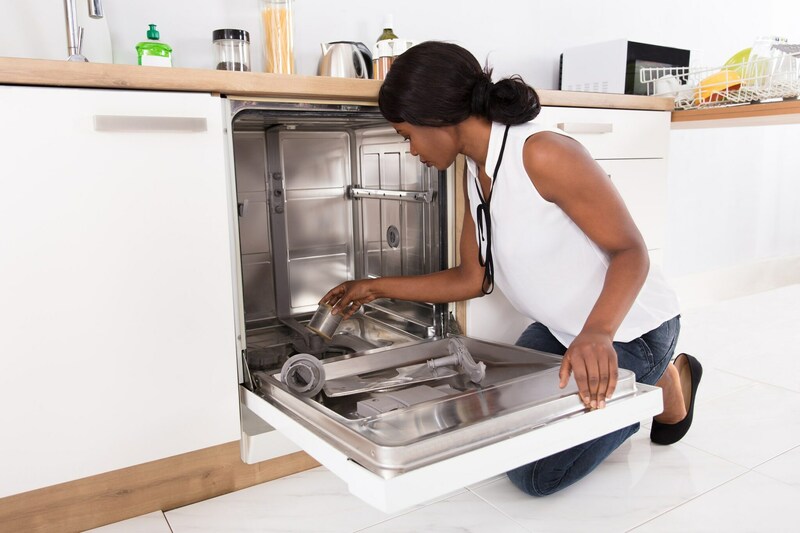 A dishwasher that doesn’t clean your dishes properly is very frustrating, and even models that are only a few years old can suffer a significant drop in cleaning efficiency. 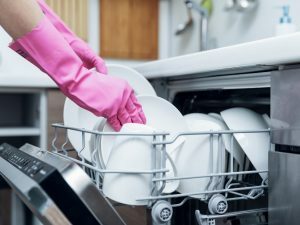 This article will show you how to remove the spray arms to unclog them, how to thoroughly clean the inside of your dishwasher, and how to stop the problem of dirty dishes. 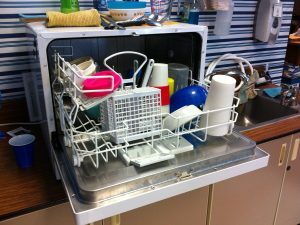 One of the main causes of inefficient dishwashers is clogged spray arms, but you’ll be pleased to know it’s easy to fix. 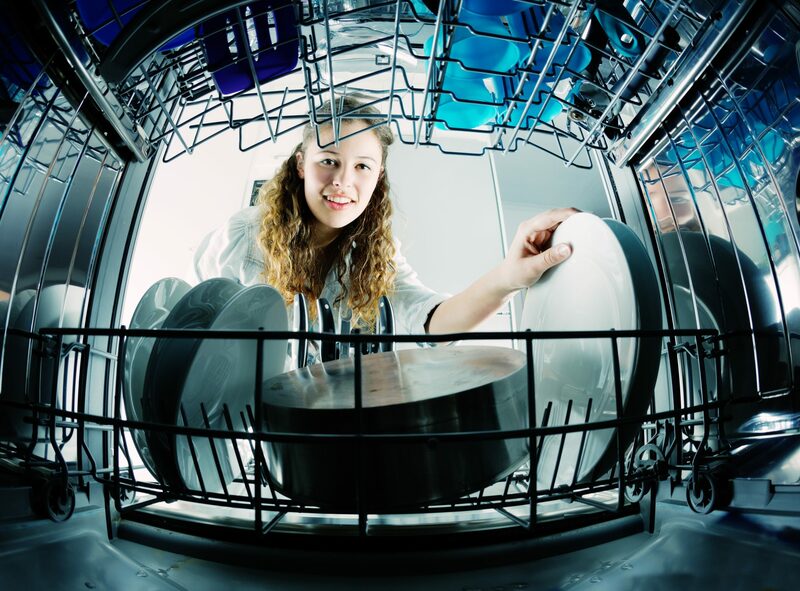 In hard water areas, the sprayers quickly become clogged, and the new non-phosphate dish detergents are great for the environment, but not so good for our dishwashers. If you have a GE dishwasher, simply remove the lower spray arm by turning it counter clockwise and pulling up at the same time. Remove the top and middle spray arms by using a ratchet and appropriate-sized socket. They’re often a ¼ inch size, but your dishwasher may be different. If you have difficulty removing the spray arms, there are video tutorials available for most brands on the internet. Check all the holes in the spray arms for clogging, then you can use one of three different methods to remove the gunk and debris from the holes. Steel picture wire or thin steel cable can be used a bit like dental floss to thoroughly clean out the holes, or you can use a cheap wire hanger to do it. If you’re not sure what size steel wire to get, take the arm to the hardware store with you to check. This will take care of any dirt you missed with the wire. 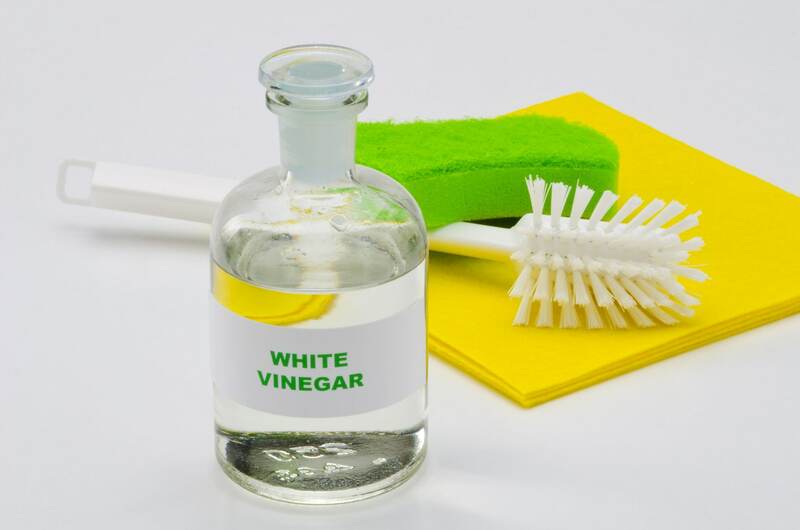 White vinegar will break down scale buildup and old dishwasher soap, and you simply put the spray arms in a clean kitchen sink and soak them in white vinegar for half an hour or so. How often do you actually clean the inside of your dishwasher? You may be surprised at what you find in there – chunks of old food, broken glass, even small toys! Check the bottom of the dishwasher for any obvious debris. Feel around with your hands in areas you can’t see – you should wear some rubber gloves for this. Remove the cover to the reservoir where the water drains, and reach down in there to take out any food bits or other rubbish. Yes it’s an unpleasant job, but it only takes less than a minute and could save you a fortune in repair bills in the future. There is probably also a fine filter in your dishwasher, which is circular with fine mesh sections on it. Clean off the mesh by running it under hot water. 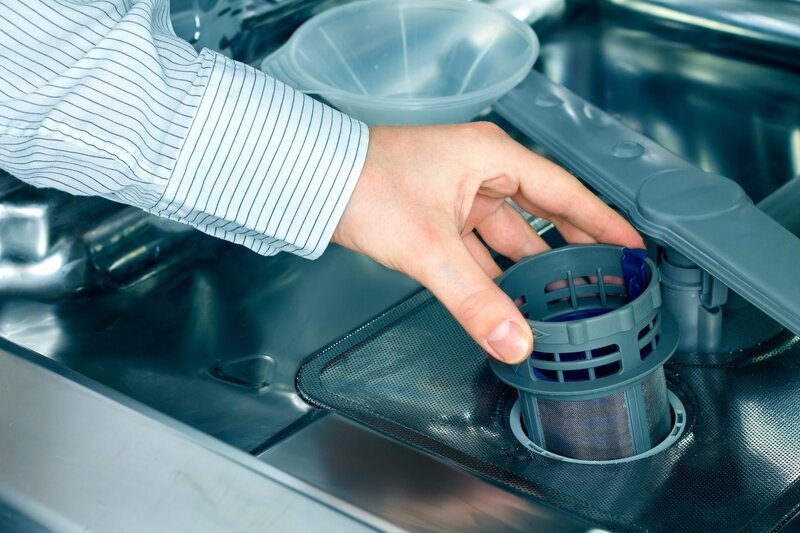 Ideally you should clean the fine filter once a month, as the residue on it can be sprayed back onto your dishes and cups. If you take a look underneath the coarse filter, you may be horrified to see how much residue and scale is on the bottom of the dishwasher tub. Use a plastic putty knife to scrape off the residue and use super fine 00 grade steel wool to gently scrub at the crud without damaging your machine. 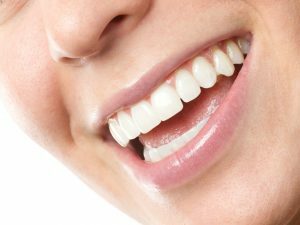 You may need to repeat this procedure a few times to totally get rid of all the dirt and scale. The door seals are easy to forget, and if you haven’t cleaned them before you may be horrified at all the gunk that comes out! Use the old toothbrush to scrub around the rubber seals and area where the door meets the dishwasher tub, then get an old cloth to wipe up the dirt. Do this with the sides of the dishwasher door and soap dispenser too. Once you’ve finished up and put your dishwasher back together, it should work far better than it did before.